Originally published in 1912, this book contains the works of renowned engineer and physicist James Thomson (1822-92), who is known for his work on the improvement of water wheels, water pumps and turbines as well as for his innovations in the analysis of regelation and studies in glaciology. A highly detailed biography is included as well as many letters of scientific importance; the book includes correspondence with Faraday, Clerk Maxwell, Andrews and H. C. Sorby, as well as his brother, renowned physicist Lord Kelvin, on subjects such as the theory of the dissipation of energy and the characteristics of natural flow in liquids. 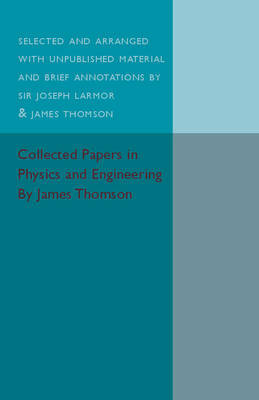 'The scientific activity of James Thomson has left permanent marks on the history of several branches of physical science' and this book contains and captures his lifelong devotion. This book will be of significant value to anyone with an interest in the history of physics and engineering.